Virtually every classic synth ever made recreated in a stunning library of sampled virtual instruments. It’s hard to write a review of bundles… the value proposition that makes buying several products packaged together at a reduced price doesn’t translate to a shallower product experience. Such is the case with UVI’s Vintage Vault, a collection of 14 of their most popular sampled software synthesizers. At over 63 GB FLAC Lossless (114 GB in WAV), the Vintage Vault contains 36 unique instruments and over 5,000 presets for $499, an 80% savings off the $2,400 it costs to purchase the instruments individually. With individual instruments costing between $99 and $299, anyone looking to pick up more than two of the downloads should be looking closely at purchasing the whole collection. This review will be a working review, with deeper dives into individual products as time goes one. That said, a few hours with each instrument reveals a pretty consistent level of quality and design. UVI’s Vintage Vault includes the following UVI stand-alone products- UVI Darklight IIx, UVI Digital Synsations, UVI Emulation II, UVI Emulation One, UVI Mello, UVI String Machines, UVI The Beast, UVI UltraMini, UVI UVX-3P, UVI UVX10P, UVI Vector Pro, UVI Vintage Legends, UVI WaveRunner, UVI Beat Box Anthology. Harmony Central has reviewed several UVI software instruments in the past (one included in the Vintage Vault collection) and has found the samples to be consistently authentic and richly toneful. Depending on the instrument, the software tends to require minimal to standard levels of CPU power, with only the biggest and most complex instruments (UntraMini in particular) requiring some muscle. Whether run in the UVI workstation or within a DAW like Pro Tools 11 or Logic Pro X, the instruments perform glitch/lag free through the Native Instruments Komplete Audio 6 into a standard MacBook Pro from 2011. Darklight is actually three different sampled instruments, the original Fairlight (think everything 80’s, from Peter Gabriel to Herbie Hancock) and a Beat Maker and Sampler inspired by it. Original unit made acclaim through its revolutionary digital synthesizing, and Darklight completely captures the aliasing halo that defined the Fairlight. Digital Synsations, like the Darklight, is focused on digital synthesizers, these ones more affordable at the time and brought polyphonic synths to the masses. The sampled instruments included are the Yamaha SY77, Korg M1, Roland D50, and Ensoniq VFW. All three synths are decidedly rooted in 80’s pop and pre-Industrial goth. The Emulation II is another synth recreation that is all about the 80's. 12 bit reproduction sounds the right amount of compressed/lofi to nail the original digital unit, and the drum machines are unapologetically digital recreations that were once cutting edge and are now gilded in nostalgia and ripe for retro-lofi hipster irony. New Order is a few clicks away. The UVI Emulation One is sampled from the original Emu, and is the quirkier precursor to the Emulation II. While the sound samples are more limited that its big brother, they are also disctincyl different and incredibly evocative of early 80's rock from Bowie and the gang. A 60’s mainstay made famous by The Beatles, Yes, and Moody Blues, the classic Mellotron used actual tape for each of its settings, resulting in a warm, slightly warbly tone that could be considered the first looper. The Mellotron may have been overused in the 60's and required a temprary retirement, but if chorus can make a comeback from the 80's there's no reason bands can't rediscover the 'Tron. Speaking candidly from the year 2014, the original attempts to recreate orchestral stringed instruments with the analog technology of the 70's was a nobel but far from successful experiment. That said, while the original synths may have missed the mark in capturing the attack, sustain, and acoustic vibrancy that defined the instruments they were attempting to emulate, they did create an entirely new synth sound that is now every bit as uniquely iconic and pervasive as the instruments they failed to copy. All sampled instruments in UVI String Machines nail their analog physical counterpart (with polyphony!) and are ready to score the sequel to Blade Runner. The ultimate FM synth collection, UVI The Beast is a bit crazier than most of the instruments in Vintage Vault, with a focus clearly more on the synthesis and modulation of sound waves than in recreating other effects. As such, the interface and options have the feel of a mad scientist's secret laboratory... so many knobs, so many miniscule tweaks. The results can be undeniably amazing and inspired, and there's no doubt this program is just as inspiring as the 70's machines that it samples. The ultimate sampled Moog... one from a 1979 unit and one from a 2011 unit. Read the full review on the UVI UltraMini instrument here. The UVI Beat Box Anthology is a kind of outlier of the group, being entirely focused on the early drum machines and beat boxes that spawned the early electronica/New Wave scene and was the leader of early Hip Hop beats. Like all UVI products, the Vintage Vault requires the free UVI Player or MOTU to play the instrument. Such a deep collection of vintage effects is enough to keep any level of player busy for years. Most won’t even be able to get through all the presets. 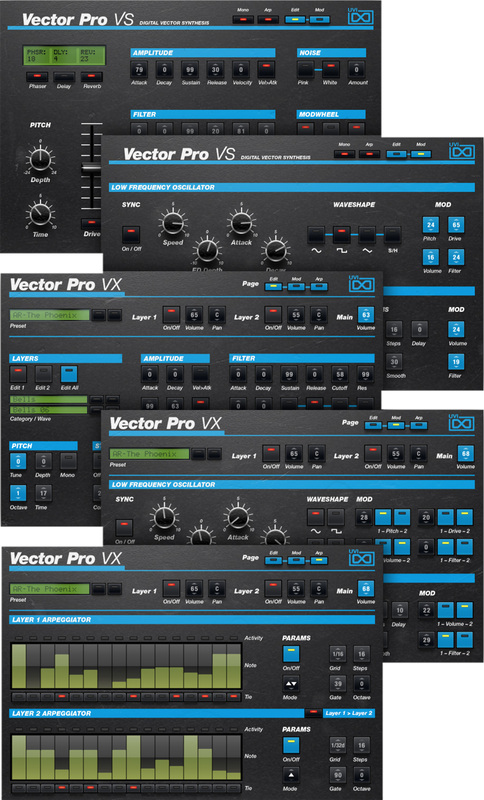 Short of shelling out well over $100,000 to purchase the original units UVI sampled for these instruments, there’s hardly a more authentic way to get access to every major classic synthesizer style and type.